Training Centre Is Classicbond EPDM BBA Certified? Is Classicbond EPDM BBA Certified? Yes, ClassicBond membrane holds the British Board of Agrément certificate, No. 11/4853 (issued to Flex-R Ltd). It also holds fire ratings for each of the thicknesses available. Yes. 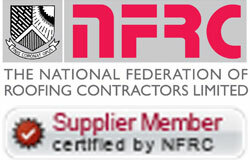 ClassicBond EPDM holds the British Board of Agrément certificate, No. 11/4853, issued to Flex-R Ltd. The BBA carries out assessment, testing, approval and certification of products and systems for the construction industry against national requirements, internationally recognized standards or other relevant technical specifications, reviewed and reissued every 3 years. The ClassicBond system is also fire rated, the 1.2mm EPDM has a fire rating of EXT.F.AB and the 1.5mm EPDM membrane is fire rated to EXT.F.AA. Fire rating is carried out on a variety of deck surfaces and it is important to seak the certificate that relates most accurately to your roof structure.